Did you know that if a UFO passed a Shuttle in flight, that no astronaut will mention it? Why? Because the official policy of NASA is to ignore UFO's! I'm not making this up. I confirmed this with a person who works at NASA and has been there for decades. I asked if acknowledging a UFO was off limits at NASA even if one is visible during a flight. The answer: "Yes." Why? The explanation was something like: "We don't want people to panic." Check out this video from a shuttle flight. As the astronauts talk, you can see something flying in different directions over the earth below (not just the same direction like satellites might do). This is one of many strange flying objects captured by NASA on space flights - which used to show real time video until UFO's starting showing up on tape. There is another video clip showing an object hanging on space - until it rapidly changes direction when another object appears to shoot a light beam at it! Here are some clips of NASA astronauts on early missions including a clip of a 1989 Discovery flight discussing "alien spacecraft" hovering nearby. Would acknowledging UFO's make people doubt our superiority? Would it make funding for NASA less or more important? For the record, I love NASA, but this policy seems to be the opposite of what having a space agency is all about. Explore new worlds? Go where no man (or woman) has gone before? To do that the policy should be willing to disclose that we don't have the most advanced technology circling our globe. Shouldn't we be curious about these objects? Where they come from? What do they want with us and/or our planet? Putting our heads in the sand and pretending not to notice advanced technology isn't a solution. Having a space agency with a policy prohibiting acknowledgment of UFO's - even when they fly past our Shuttle -- isn't dealing with the real world. This policy should be reversed. Maybe that change will spark the public's interest in developing the next generation of space technology. Photo: Testing Fuel cell powered computer servers for eBay. A new fuel cell made mostly from sand instead of precious me just announced by Bloom Energy may make power stations and carbon emissions a thing of the past. It could remedy both our need for power and to reduce carbon emissions at the same time. Presently it is being tested and it works. It is also cutting power costs in a big way. These are some of the new industries and jobs that will be created by moving to greener, cleaner energy sources. LWV and a Republican pollster: If the Scientists are Wrong on Climate Change..
"If we do it right, we get cleaner air. We get less dependence on fossil fuels and enhanced national security. We get more innovation in our economy. More jobs and more sustainable jobs. And that's if the scientists are wrong." Didn't expect that did you? Moral: Fighting climate change will produce the next generation of jobs, technical advances needed for our economy to keep up with the rest of the world, and cleaner air -- even if the scientists are wrong. (If the climate skeptics are wrong, we end up with dirtier air, an over-heated, dying planet - definitely bad for business). Which is worse? A new study suggests that global warming aka climate change could reduce the number of hurricanes (the good news) but that the ones who occur could be stronger (the bad news). The study estimates that future hurricane damage could be 28% HIGHER. A Professor who lives near Rice University in Houston told me that their neighborhood has had a series of break ins lately - people throwing BRICKS and PAVERS through people's windows, then grabbing a laptop, TV, etc., then fleeing in the blink of an eye. I got another call from a couple who could not sleep until security film was installed on their windows -- after someone broke a 4’ x 4’ window one day, and stole everything. They felt insecure even with a new window in place, until security film was installed on all the windows. A recent explosion in Seabrook rattled windows for miles around. Another one in New York blew out the windows of a Starbucks. A special energy saving film sold by Armor Glass would have avoided a breach – and injuries from flying glass in each case. It is estimated that the damages from Hurricane IKE that hit Texas in 2008 was $22 billion, including flooding, roof and window losses. Add 28% to that figure for the next storm that hits - assuming it isn't a CAT 3 or 4, which would do even more damage than CAT 2 IKE. Katrina was a CAT 3. Nearly 25% of the U.S. population lives near the coast, meaning that bigger storms will threaten a significant portion of our citizens and destroy more property unless the property is protected (and building codes improved). I have heard estimates that the damage to Chase Bank at 600 Travis in Houston is about $40 million. Had Armor Glass security film been on those windows, millions in damages would have been avoided -- because the film with attachment would have kept those windows from being sucked out even if they had been broken! The cost of installation would have been a fraction of the cost of damages, not including lost productivity, computer files destroyed, data lost, etc. And it would have also cut their energy consumption and tenant UV exposure. Remember the story of the three little pigs? One built a house of straw, one built a house of sticks and one built a house of bricks. Only the pig with the house made of bricks survived - but only if that pig had installed our security film on its windows to keep out (1) the bad wolf throwing a brick through the window and (2) hurricane-force winds and windborne debris breaching a window that leads to roof loss in a storm! Now, the CPAC has just proposed Ron Paul for President – who believes the Federal Reserve should be dissolved and big institutions should have failed instead of being bailed out. If he -- or someone else with a similar view -- becomes President and unemployment surges higher as institutions are allowed to fail, expect more unemployed desperate people to be assaulting your property. (Remember President Hoover in the 30's? Doing nothing in a depression cost him the next election to FDR). So get protected today before things get worse. The good news is that protection is available and that Armor Glass security film is Large Missile rated (4.5 lbs -- or the size of a brick hurled at the glass). Moral: Armor Glass security film would have stopped the unemployed Big Bad Wolf from breaking into Piggy No. 3's house, protect him from future Hurricane force-winds, while saving him energy (= $Money for the piggy bank) at the same time, regardless who is President! Pilot's Kamikaze Attack on Austin IRS - Why isn't it terrorism? Have you noticed? When a white guy shoots up a federal building and kills a guard, or dives a plane into a federal building -- like the one that just crashed in the IRS building in Austin -- that it is a "criminal" act. But if the same thing is done by a Middle East guy, like the Ft Hood Shooter, then it's an act of "terrorism." Frankly, they are the same and should be treated the same. A domestic terrorist is no better or different than one from a foreign land. Was Timothy McVeigh's blowing up the Murrah building in Oklahoma City just a criminal act? Killing someone because you are "mad" at people or the government is WRONG regardless of your color or country of origin. That leaves the question how to head off these crazy acts. One way is to stop listening to the anti-government hysteria going around. The nut jobs running the "Tea Party" and people like Glenn Beck and Rush Limbaugh have stoked the fires of irrational thought by giving one-sided, distorted commentary, the equivalent of shouting "fire" in a theater, causing panic. Crazy talk about Secession is tolerated as if it is normal. Congress reps have done the same, like Iowa rep Charles Grassley falsely saying that the health care reform would result in a death panel for grandma. It's no wonder why out of control anger is causing people to fly airplanes into a federal buildings, as if it will solve anything. These acts will only injure or kill innocent people. How to protect yourself? Self defense is the best offense when you don't know what the next nut will do to make a point. The opening scene of “Charlie Wilson’s War” is a hot tub party featuring both strippers and a Texas Congressman (no, not “Hot Tub Tom” DeLay) – but one who looked beyond the confines of the hot tub and saw something no one else did. Charlie Wilson had a vision that lead to the defeat of the Soviet Union. But it is the last scene that you really need to watch closely. 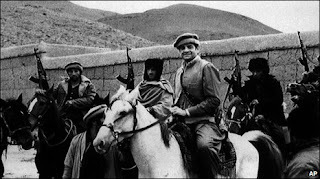 Charlie Wilson saw from the hot tub a TV news report by Dan Rather, portraying a people with no weapons fighting the Soviet Invasion of their country, Afghanistan, in the 1980’s. Joanne King Herring was the woman who got Charlie to see the global picture and its potential impact on the U.S. So Charlie got other key Congressmen interested. With their funding --for Soviet anti-aircraft and anti-tank missiles acquired with help from both Israel and Egypt -- he helped rain hell on Russian Gunships that had been shooting civilians until the Soviets couldn’t take the body count anymore and got out of the country. After his fellow Congressmen had gladly voted for billions in weapons for the Mujahedeen, when the Russians left and Afghanistan was in shambles, Charlie couldn’t get them to fund even a couple million for a school. Without schools and an economy, a vacuum was created in which stepped Osama bin Laden, who provided money in return for a safe haven. Moral: If we don’t provide schools and education to failed States like Afghanistan (Somalia, etc.) then the extremists fill the void and tragic events like 9/11 will happen, again. Charlie would say the same today about Pakistan. If all we do is provide weapons and we don’t help countries like Pakistan and Afghanistan provide education for tens of thousands of children, then the extreme religious schools will continue to fill that void, filling their heads with extremist views instead of math and science. Instead of getting to know American books, the young students get a message of hate towards us, feeding the never-ending stream of suicide bombers willing to die. Don’t forget Charlie’s lesson. It takes more than weapons to protect us. I am sure that Joanne King Herring will remind you of it -- if you listen to her. We need more Congress men and woman like Charlie Wilson and Americans like Joanne King Herring, people who think beyond the box. Check out the movie “Charlie Wilson’s War” in honor of Charlie, and pay attention to all of it. You’ll get a lot of laughs and be a wiser person as a result. We salute you Charlie. You were no angel but you did a world of good. If the "Tea Party Convention" was the real Tea Party, then it showed its true nature - a whites-only, palm-reading, anti-Obama Cult with no platform but plenty of double standards and platitudes, hate and division. One tip off? When Palin mentioned the word "Texas Secession" there was a huge cheer from the crowd! What? Breaking up the USA is patriotic? How many normal Americans go around talking like that? No one with a real brain that I know. That would leave Texas last in education in the world instead of just the USA 50. And then there was the speaker who claimed our President was not born in the US (that again, despite existing Hawaiian birth certificate), while failing to mention that his opponent, John McCain, was born in Panama. What's the difference between foreign country X or Y? Do you think they'd be mentioning this if McCain had been elected? Of course not. So including this speaker makes the movement look racist to me. Did you notice that 99.9% of the people at the convention were WHITE? How does that represent the wonderfully diverse America I know? No. Finally, there was no platform. It was all about the speaker. And the speaker had to use the palm of her hand to remember three simple things - using her "crib notes" within minutes after criticizing President Obama for using a TelePrompter. At least Obama can stand and speak to the opposition without a single note or paper to guide his brain. This was the same speaker, Sarah Palin, who chastised the White House Chief of Staff for using the word "Retard" but then excused the use of the same word by her ally Rush Gasbag (aka Limbaugh) for saying the "Democrat retards were retards. Limbaugh can say retard anytime but not anyone else. This is the same hypocritical double standard of politics, where sins are only sins when the other side does it, but not when your side. Lying, double standards and disrespect is wrong regardless of who does it. That is not about real Americans. The Tea Party Convention appeared to be an anti-Obama cult without a plan or a platform. It's unfortunate because we need teamwork on both sides of the aisle to compete in a global century. We certainly don't need more double standards and palm readers running our country. 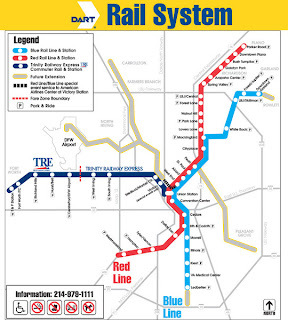 Map of the Dallas Rail System - Compare to Houston's one short line taxpayers had to finance when DeLay blocked federal funding for it...and gave it to Dallas instead! This Houston Chronicle article is an excellent summation of the failure of our Texas leadership preparing us for the 21st Century - as we add another 2 million people in Houston alone. The article is right about Tom DeLay's sabotage of federal rail money for Houston - money Houstonians pay as part of the pump price when they fill up. Their lack of leadership has left us crawling on over-crowded roads, and added extra costs on our taxpayers. It was DeLay's singular cutting off Houston from rail money that was one of the reasons that drove me to run against him until he left office - our citizens were being penalized by his arrogance and lack of leadership. I sat in a Ft Bend lunch after lunch for 400 people when I heard DeLay declare "Dallas rail is a total failure." That was a total lie, but no one else in the room knew it. This was right after Dallas citizens had voted to increase their rail system they were so happy about its success. Gov. Perry has continued this tradition of sabotaging the future for ordinary Texans such as his Trans Texas land grab that favored Spanish corporations over the Governor's own citizens. We need a Texas Governor who hasn't been in office for a decade and really does have vision - unlike now. Perry governs as if all decisions are approved by GOP primary voters. Having been in GOP primaries, I know that primary voters do not reflect the majority of all Republicans, not to mention everyone else. I found the November Republicans much more more moderate and practical in their views. Unfortunately politics now trumps leadership. Ed Emmett is right. We need a direct Dallas-Houston high speed rail link, not the Texas T Bonehead plan Perry floated and failed to coordinate. People like Tom DeLay and Gov. Perry have cost Texan taxpayers more billions out of their pockets. When will they realize that leadership is about us, not them. Think about that as you are crawling along our freeways. Lawyers will confirm that free speech does not give one the right to stand up in the theater and shout "FIRE!" when there isn't one. That causes panic that can injure or kill people. But people in high places like Glenn Beck are doing exactly that. When he claims our President and his people are going to "slaughter Americans," his hate-mongering speech would make a Nazi proud. It's not even based on true facts. That makes it a lie and un-American. If it causes a nut case to shoot someone, then the corporate sponsor of such verbal violence has potential liability for giving such over the top extremism a national voice. Why feed the hate when the ship was wrecked by the last crew, not this one? We are in this mess after the past administration's doubled our total debt in 8 short years (after getting a $200 billion surplus from Pres. Clinton) and leaving the economy locked up like an engine without oil and heavily damaged. Reality should be in discussion in America, not beating drums -- not screaming "FIRE!" "Hang him!" (remember those days before courts?) and false information. We had Frankenstein. Now we have "Beck-enstein" a more dangerous monster because he is a real person influencing the vulnerable. It smacks of Nazism and hate-mongering. It's not even based on reality. After all, it was the last administration that lit the fuse by not paying for anything including two wars, Plan D and a fat tax cut for the top 5% (while everyone else got a few crumbs). Once the Exxon Valdez was on the reef, do you think it was cheap to fix the damage? I have to wonder what has happened to Americans moral compass. It seems that no one really bothers checking the real facts, but everyone has an opinion -- usually based on an email from another Internet Cement-head. Reinforcing stupidity is not going to keep us ahead of our global competition. When I post articles on India going into space some Americans assume (wrongly) that is was with our money instead of their own money and technology. If our general population remains this clueless, our leadership status in the world is toast. The last administration inherited a nice Mercedes, but turned over a smoking wreck. We can't afford to be stupid from here on out. I see that the GOP has once again proposed its fix: Privatize social security. How would you like it if the last meltdown just cut your social security 50% like it did your stock portfolio? Come on dudes, repeating past mistakes is not going to fix our awful financial situation. Americans should be dealing in reality and real numbers, if anyone paid attention to more then what is on the dinner plate. This brings up something else. I am amazed by how shallow Americans seem. Look at the entries on Facebook. Who cares if you are staring at your toes. I'd like to see at least some wit and thought included. Americans, we are better than hate-mongers and shallowness. We need to focus on real facts and ways to get out of this situation. On that note, we need common sense instead of more stupidity - by both our leadership and Main Street. And neither will morons like Glenn Beck. People like him are the problem, not the solution. Entrepreneurs in Space? Taking Over our Space Transport From NASA? Now that is a GREAT IDEA! The strange part is that the GOP is horrified by the thought of entrepreneurs taking over. What's wrong with that? It costs over $500 million for just one Shuttle launch, a machine originally designed with 1970's technology. Space Entreprenur Richard Branson and his team launched SpaceShipOne for under $25 million - peanuts. SpaceX is also a player. They were planning a private orbiting hotel. Obviously, you need a way to get to and from that hotel in a cost effective manner. I would bet on these guys and the others who will follow for our next phase: Space Business, led by private entreprenurs. As India and China plan their own space launches to the Moon (with their own money and technology) NASA has been too slow to keep up in design. And it has been chronically underfunded. The Bush "Moon Plan" was not funded from the get-go, so it was never really going to achieve anything at a snails pace. Even NASA's head, Gen. Bolden, thinks it is a good idea. Getting to space is not new technology. Getting to space economically will require entrepreneurs to keep us in the race with India and China. At the slow rate we are going the world will pass us by unless we do call in the American entrepreneurs. The U.S. has too much financial debt to keep space transport an exclusively government enterprise. We don't need a government monopoly. That strategy has led us to having to ride on Russian rockets as the aging Shuttles are sent to museums and NASA struggles to build a replacement five years behind schedule. Give the Obama administration credit for putting trust in America's entrepreneurs for the next frontier: Space. It isn't the final frontier, but it is mankind's next one.